All five CGI-animated prehistoric adventures. 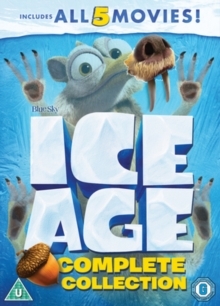 In 'Ice Age' (2002), a group of three animals embark upon an epic journey at the dawn of the great ice age. 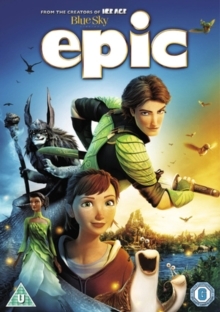 Sid the sloth (voice of John Leguizamo), Manny the woolly mammoth (Ray Romano) and Diego the sabre-toothed tiger (Denis Leary) team up to help return a human baby to its father and must risk life and limb as they traverse boiling lava pits and travel through dangerous ice caves to complete their mission. 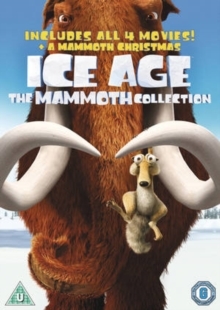 In 'Ice Age 2 - The Meltdown' (2006), Manny yearns after a family, but nobody has seen another mammoth for a long time; in fact, Manny thinks he may be the last one. That is until he miraculously finds Ellie (Queen Latifah), the only female mammoth left in the world. The only problem is, they can't stand each other... In 'Ice Age 3 - Dawn of the Dinosaurs' (2009), Scrat the squirrel (Chris Wedge) is still trying to get his paws on that ever-elusive nut, Manny and Ellie anxiously await the birth of their mini-mammoth, and Diego wonders if he's growing too laid-back, living the life of a pampered house cat. Meanwhile, Sid gets into trouble when he creates his own makeshift family by hijacking some unusually large eggs, and inadvertently discovers a mysterious underground world where dinosaurs still roam. In 'Ice Age 4 - Continental Drift' (2012), the entire continent is set adrift following a global cataclysm and Manny, Diego and Sid find themselves separated from the rest of the herd. Commandeering a nearby iceberg as a makeshift boat, they take to the high seas. Fearsome sea creatures and battle-thirsty pirates are among the challenges faced by the intrepid trio as they ride the waves of the world in search of their family. The fifth instalment, 'Ice Age: Collision Course' (2016) sees Scrat, fed up of being defeated by his acorn which has now taken to the skies, catapulted into outer space. But when he crashes his craft, he unwittingly sets off a series of catastrophic cosmic events that threaten the future of planet Earth. 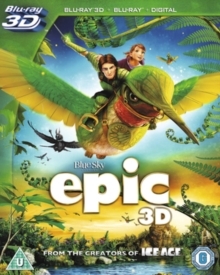 As an asteroid hits Earth, Manny, Ellie, Sid, Diego and the gang decide to pack up their things and move as far away as possible from the falling boulders. As they embark on an epic journey to find a new home, they come across some new and exciting sights as well as some interesting characters.